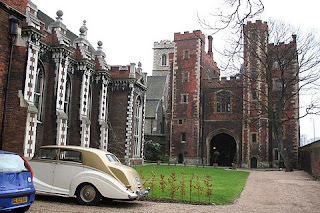 A visitor to London, exploring the Borough of Lambeth, and having followed the Thames Path from the South Bank Centre to Saint Thomas's Hospital, can continue along this path, arriving, after a short walk, at Lambeth Palace, the London residence of the Archbishops of Canterbury since around 1200 AD. 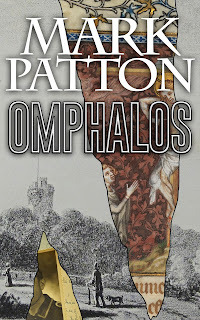 I do not usually take readers inside such attractions: they have their own websites, and I wouldn't wish, as it were, to spoil the plot, preferring to weave a connecting path between them. I will make a couple of exceptions in Lambeth, however; in this case because the palace, being very much a working environment, is only occasionally open to the public, an places on tours often fill up within a matter of hours of being advertised (the library, however, is accessible to researchers by appointment). 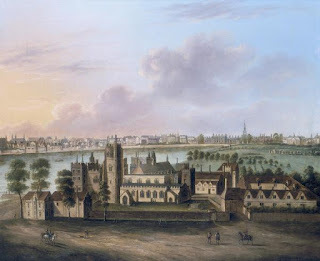 Lambeth Palace from the south, in c 1685, Museum of London (image is in the Public Domain). 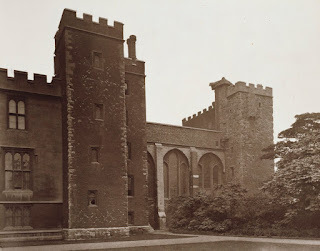 The early Tudor gatehouse, which is, from the outside, the most prominent feature of the palace, was completed in 1495. The Great Hall (left) and Gatehouse from inside the palace. Photo: Richard Croft (licensed under CCA). 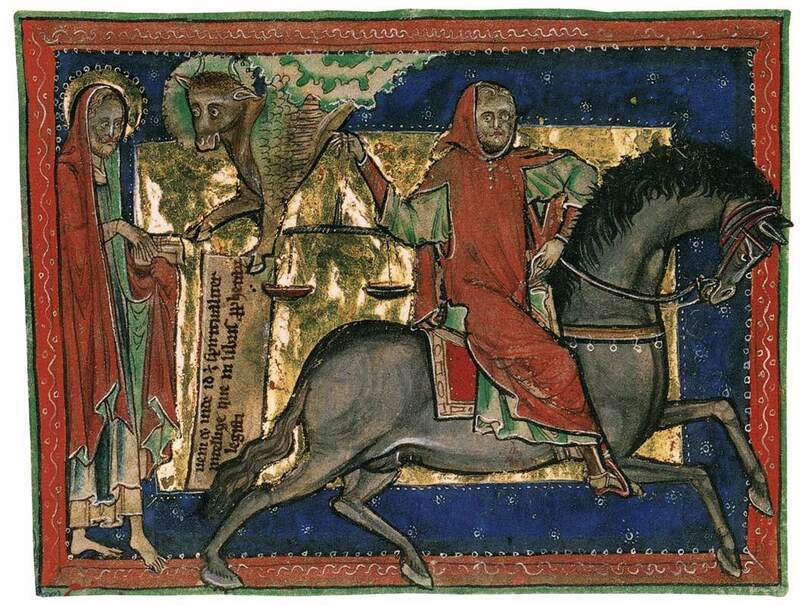 Within, the so-called "Lollards' Tower" is earlier than this (c 1435). 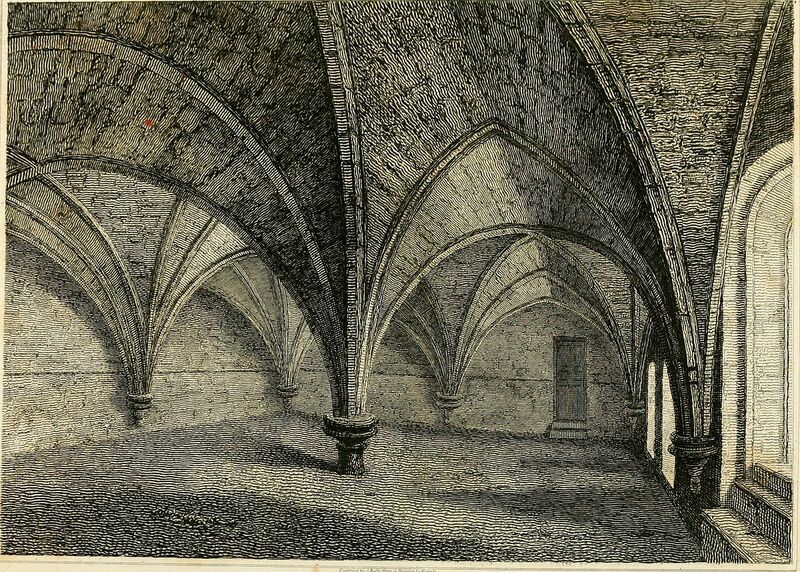 An upper room has clearly been used as a prison, and it used to be supposed that the prisoners were Fifteenth Century Lollards (proto-Protestants, who sought to make the Bible available in English), but the graffiti in the room date to the Seventeenth Century, and it seems that the true "Lollards' Tower," at Saint Paul's, was destroyed during the Great Fire of 1666. The "Lollards' Tower in c 1883. Photo: Henry Dixon (image is in the Public Domain). Of the Thirteenth Century Palace, all that remains visible is an undercroft, originally used for storing wine, beer, and other produce. 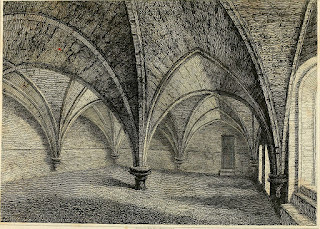 The Undercroft in c 1804 (image is in the Public Domain). 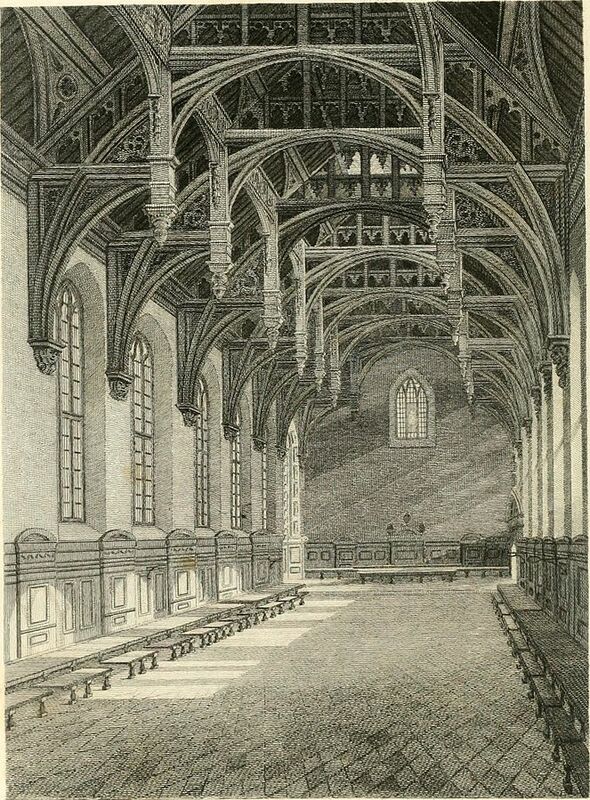 The Great Hall, which now houses much of the library, was rebuilt in 1663, following extensive damage by Parliamentary troops during the Civil War (Samuel Pepys described it as "a new old-fashioned hall"), and was further restored following bomb damage in the Second World War. 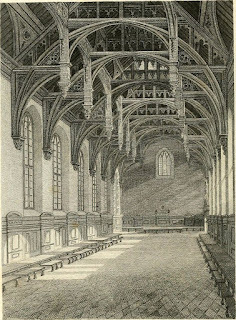 The Great Hall in c 1804 (image is in the Public Domain). Among the great treasures of the library are the Mac Durnan Gospels, dating to the Ninth or Tenth Century; the Lambeth Bible, dating to the Twelfth Century; and the Lambeth Apocalypse, dating to the Thirteenth Century. 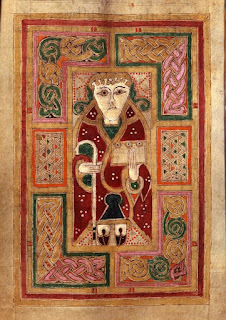 The Gospel of Saint Mark, from the Mac Durnan Gospels, probably a diplomatic gift from the Abbot of Armagh to the Anglo-Saxon King, Aethelstan (reigned 924-939 AD), who presented the manuscript to Christchurch, Canterbury (image is in the Public Domain). 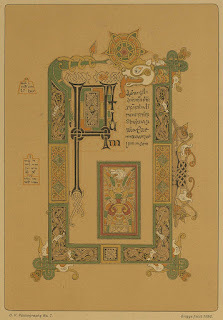 The Gospel of Saint Luke, from the Mac Durnan Gospels (image is in the Public Domain). 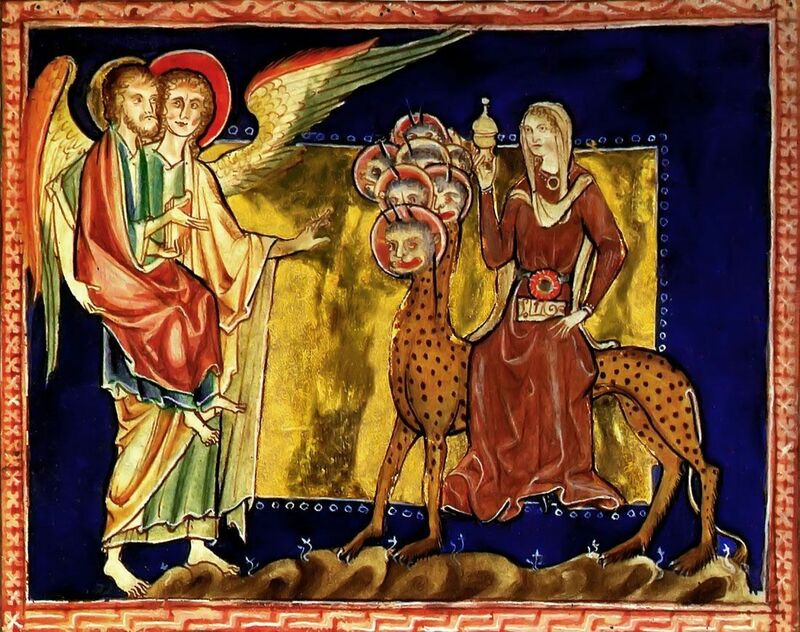 The Tree of Jesse, from the Lambeth Bible, dating to the 1140s (image is in the Public Domain). 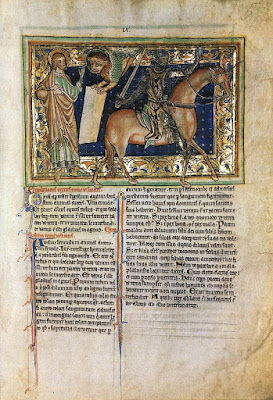 Page from the Lambeth Apocalypse, dating from c 1260 (image is in the Public Domain). 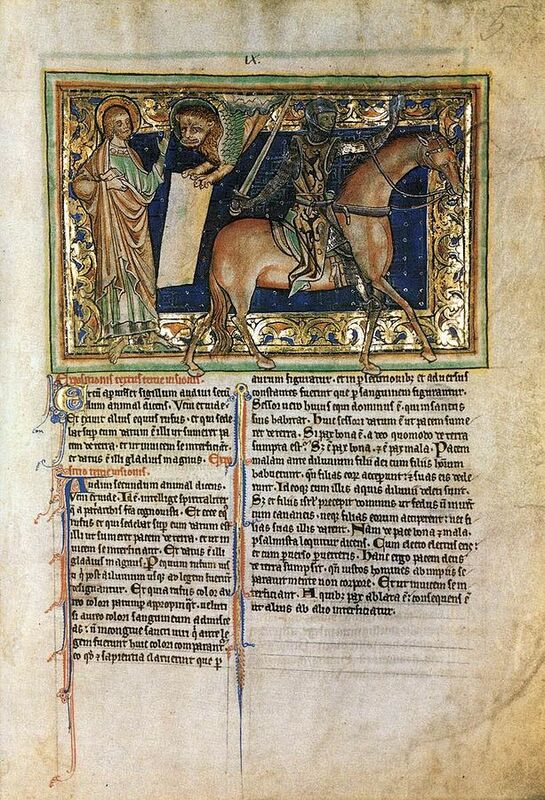 Page from the Lambeth Apocalypse (image is in the Public Domain). From the gatehouse of the palace, it is just a short walk further along the river to our next stopping-point, the Garden Museum. 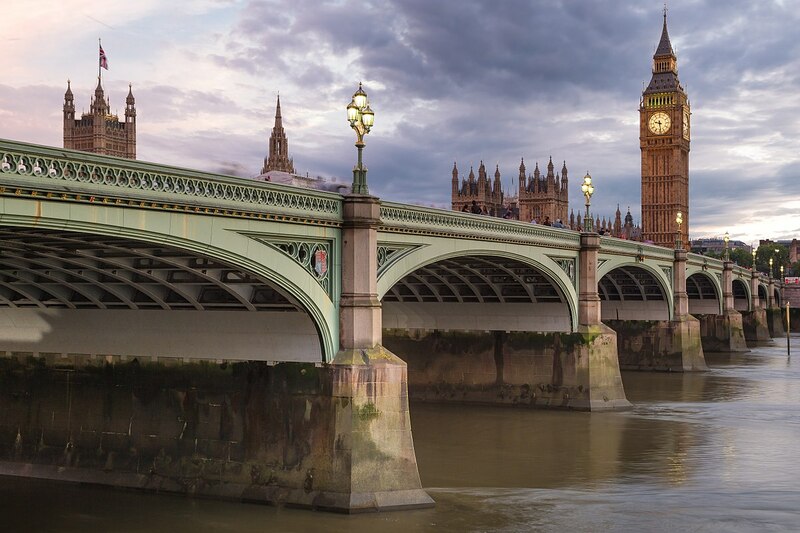 A visitor to London, exploring the Borough of Lambeth, and having viewed the site of the Festival of Britain, can follow the Thames Path southwards, towards Westminster Bridge, passing the London Eye. We are walking, here, along an embankment created by the Victorian engineer, Sir Joseph Bazalgette (of whom more in a later post), which, by making this stretch of the tidal Thames narrower and deeper, did much to alleviate the problems of flooding that once marred the lives of residents of Southwark and Lambeth, as well as those of the City and Westminster. 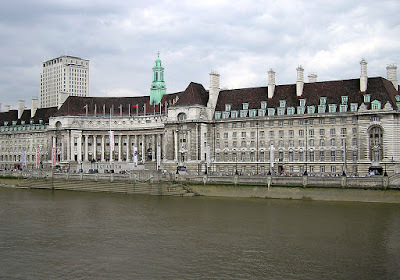 The large building on the left is the old County Hall, which served as the headquarters, first of the London County Council, and subsequently of the Greater London Council, before the latter was abolished by Prime Minister Margaret Thatcher in 1986. Designed by the architect, Ralph Knott, it was opened by King George V in 1922, and now houses hotels, restaurants, and an aquarium. 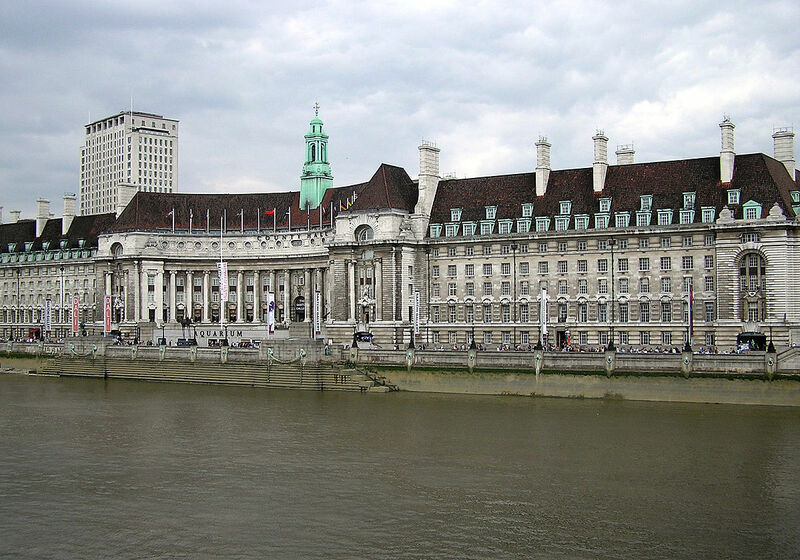 County Hall, London. Photo: Arpingstone (image is in the Public Domain). Westminster Bridge lies just beyond. The original Westminster Bridge was built by the Swiss engineer, Charles Labelye, between 1739 and 1750, in the face of opposition from the Thames Watermen and the Corporation of London, who stood to lose revenue from ferrying passengers across the river. It connected the rapidly expanding residential districts of Lambeth to Whitehall and the West End. 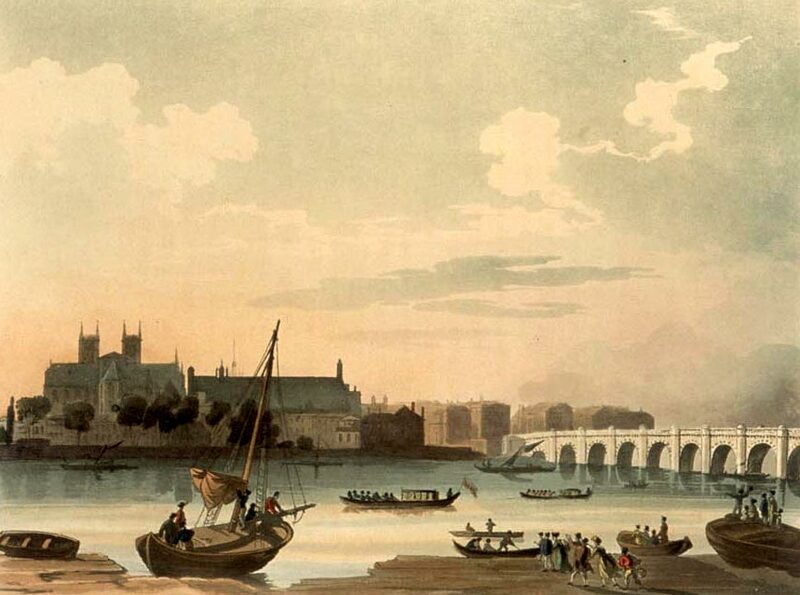 Westminster Bridge in 1789 by Joseph Farrington. Image: Stephencdickson (licensed under CCA).
" ... we left London on Saturday morning at half past 5 or 6, the 31st July ... we mounted the Dover Coach at Charing Cross. It was a beautiful morning. The City, St Paul's, with the River and a multitude of little Boats, made a most beautiful sight as we crossed Westminster Bridge. The houses were not overhung by their cloud of smoke and they were spread out endlessly, yet the sun shone so brightly with such a pure light that there was even something like the purity of one of nature's own grand Spectacles." Westminster Hall and Bridge in 1810 (image is in the Public Domain). The current Westminster Bridge is not the one crossed by the Wordsworths, but a later one, of cast iron, opened in 1862, with details designed by Sir Charles Barry, who had also worked with Augustus Pugin on the design of the new Palace of Westminster, following a disastrous fire in 1834 (this building is now undergoing major renovation works). 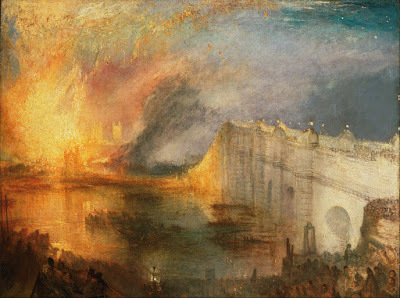 The fire of 1834, by J.W.M. 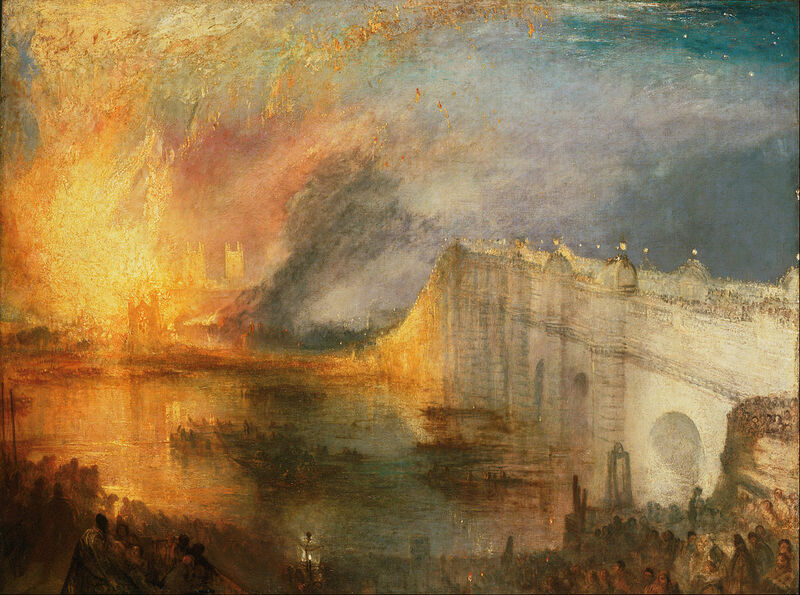 Turner, Philadelphia Museum of Art (image is in the Public Domain). Westminster Bridge. Photo: Martin Durst (licensed under CCA). The Palace of Westminster. Photo: Alvesgaspar (licensed under GNU). 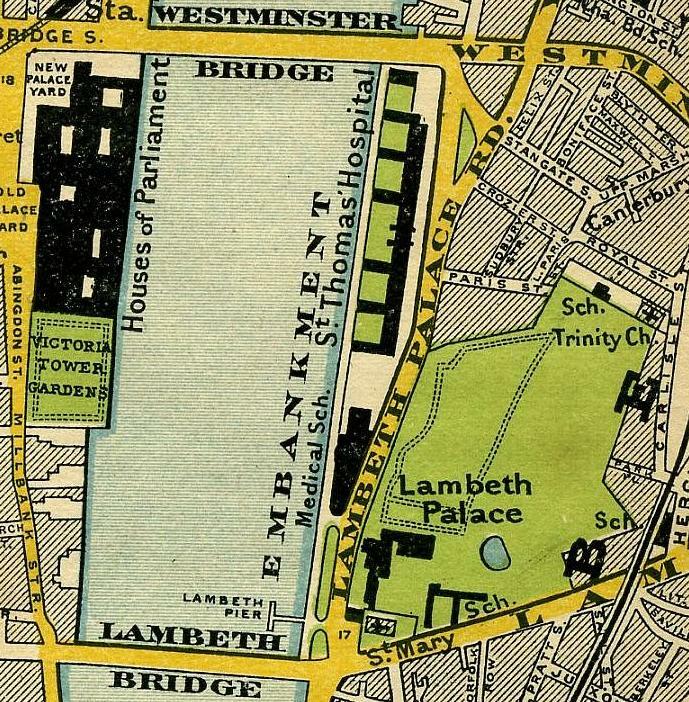 Westminster Bridge and Lambeth Bridge, 1897 Stanford's Map of London (image is in the Public Domain). 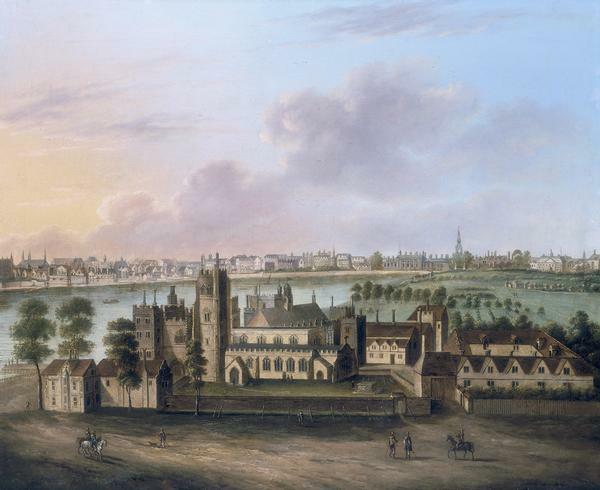 To the south of the bridge is Saint Thomas's Hospital, originally established in Southwark, in the Twelfth Century, but in its current location since 1871. 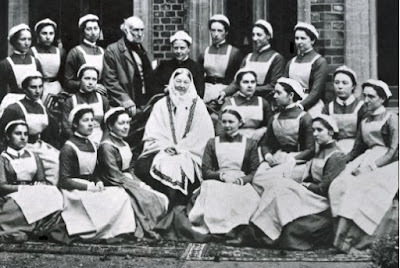 It was at Saint Thomas's that Florence Nightingale established her training school for nurses in 1860, the first secular nursing school in the World, and the hospital now hosts a museum in her memory. 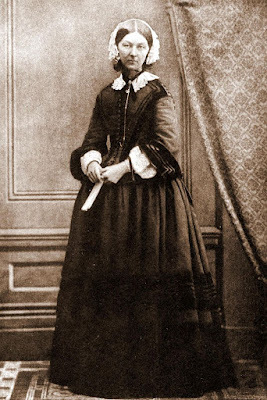 Florence Nightingale in c 1858 (image is in the Public Domain). Florence Nightingale with graduates of her nursing school, 1886. Image: FormerBBC (licensed under CCA). 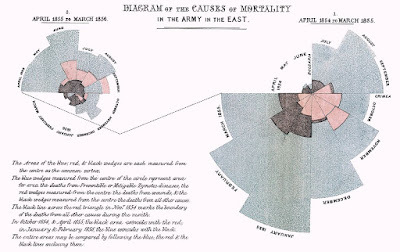 Florence Nightingale's "Polar Area Diagram" of causes of mortality in the Crimean War (image is in the Public Domain). Although she is known today primarily as a nurse, she was also a pioneer of medical statistics, and, in 1859, became the first woman to be elected as a Fellow of the Royal Statistical Society. From here, it is just a short walk to our next stop, Lambeth Palace. Winter and death are among the themes explored by some of our greatest writers during 2017, continuing some of the threads established in the previous year. Among my choices for 2016 was Ali Smith's Autumn, which led me to ask whether there could ever be such a thing as "contemporary historical fiction" (as there is surely such a thing as "contemporary history"). 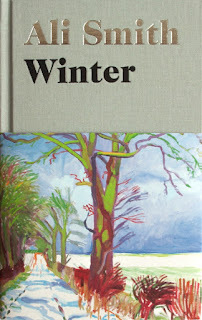 Conventional wisdom has long held that works of great literature take a long time to write (this despite the fact that Shakespeare seem to have written Henry V, Julius Caesar, As You Like It, and Hamlet in little more than a year), but Smith's sequel, Winter, was published in 2017. 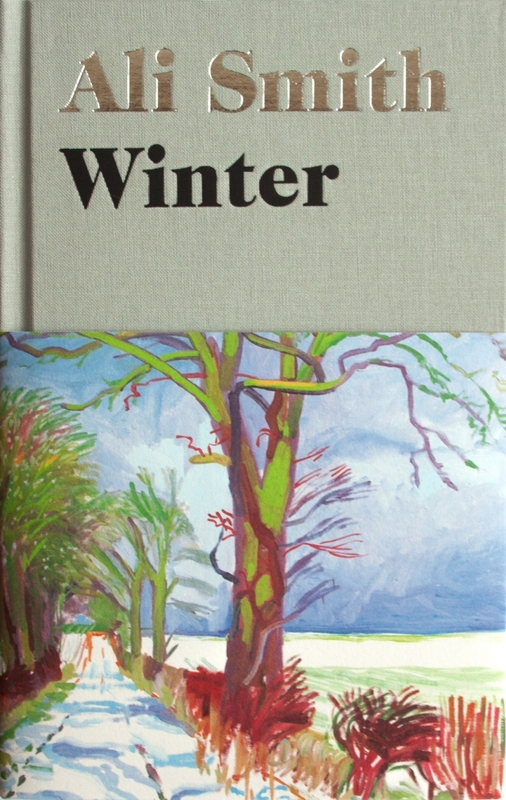 Like David Hockney's tablet-produced, PhotoShop-enhanced landscapes, which adorn the covers, Smith's four seasons novels are crafted with purposeful haste, allowing her to capture aspects of the fleeting moment (the Brexit Referendum and the murder of Jo Cox MP, in the case of Autumn; the migration "crisis," and the rise of Donald Trump and Theresa May, in the case of Winter). Conventional wisdom also holds that literary fiction is rarely funny, and Smith cheerfully drives a coach and horses through this assumption, but Winter is, to my mind, nonetheless, a less optimistic book than Autumn, taking alienation as one of its major themes: the jokes are a delight, but also a distraction (often consciously so, in the minds of the characters). Art (Arthur), the hero or anti-hero of the book, is a would-be nature-writer who seems to have little real connection to nature. He is alienated from his former girlfriend, Charlotte (who has hacked his social media accounts), and from his mother (Sophia, a once successful businesswoman), who is, in turn, alienated from her sister (Iris, a hippy and environmental campaigner), and, perhaps, even from herself (it is unclear whether Sophia is suffering from a mental illness, from a neurological condition, or from early-stage dementia). The one note of hope is offered by the character of Lux, a Croatian refugee, who agrees to impersonate Charlotte, and to spend Christmas with Art and his mother in Cornwall, and who does her best to engineer reconciliations all round. 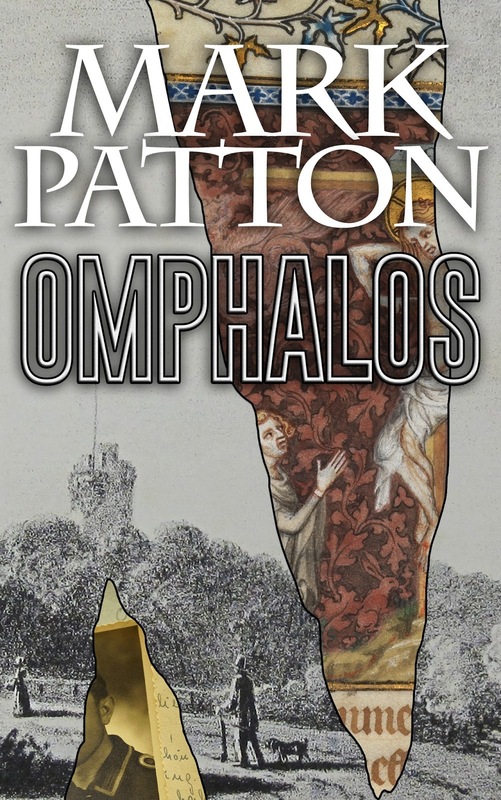 Smith's narration alternates between the present and the past tense, and between several viewpoints, encompassing the characters' memories of lives that have run parallel to Smith's own life, and to mine (the songs and films of Elvis Presley, the art of Barbara Hepworth, the death of Charlie Chaplin, the environmental insights of Rachel Carson, and the Greenham Common protests, all find a place in this rich tapestry of memories). "Achaean," by Barbara Hepworth, St Catherine's College Oxford. Photo: Munkfishmonger (licensed under GNU). Dead eagles from Seney National Wildlife Refuge, 1963. In her book, "Silent Spring," published the previous year, Rachel Carson had drawn attention to the threat to wildlife posed by pesticides, notably DDT - subsequently banned across Europe and North America. I read Carson's book as a sixth former, and the recovery of bird of prey populations, both in the UK and the USA, became a potent symbol for the human ability to reverse environmental damage. Photo: Albert Hemming (licensed under CCA). 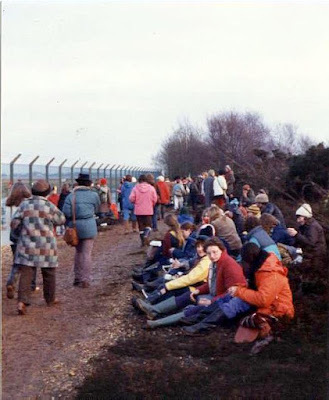 The Greenham Common peace protest in 1982 (I joined a parallel protest against nuclear weapons at RAF Molesworth the following year). Photo: Ceridwen (licensed under CCA). 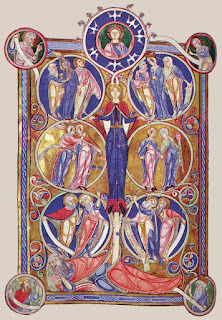 "God was dead: to begin with. And romance was dead. Chivalry was dead. 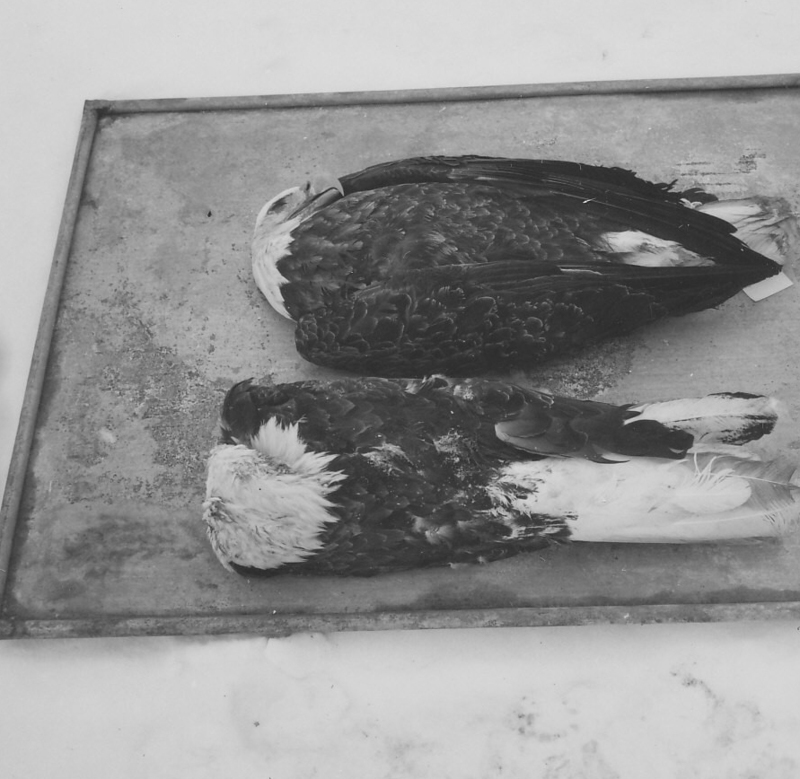 Poetry, the novel, painting, they were all dead, and art was dead. Theatre and cinema were both dead. Literature was dead. The book was dead. 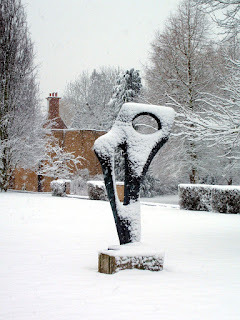 Modernism, postmodernism, realism and surrealism were all dead. Jazz was dead, pop music, disco, rap, classical music, dead. Culture was dead. Decency, society, family values were dead. The past was dead. History was dead. The welfare state was dead. Politics was dead. Democracy was dead. Communism, fascism, neoliberalism, capitalism, all dead, and marxism, dead, feminism, also dead. Political correctness, dead. Racism was dead. Religion was dead. Thought was dead. Hope was dead. Truth and fiction were both dead ... Imagine being haunted by the ghosts of all these dead things ... Ghosts themselves weren't dead, not exactly ... but in any case forget ghosts, put them out of your mind because this isn't a ghost story, though it's the dead of winter when it happens ... "
Lincoln in the Bardo, the debut novel by the American writer, George Saunders, previously known for his short stories, on the other hand, is certainly a ghost story: in its rich cast of characters, all except the single historical figure of President Abraham Lincoln are ghosts, haunting the cemetery where their bodies lie buried. Most of them are in denial as to their true status, insisting that they are merely "sick," and using elaborate euphemisms for the words that they cannot bring themselves to utter, including "coffin," "corpse," "tomb," and "grave." The most recent arrival among them is Lincoln's son, Willie, dead from typhoid at the age of eleven (Lincoln originally intended for Willie to be buried in the family's home-state of Illinois, but decided that he could not bear such a total separation, and had him placed instead in the vault of a friend in Washington, which he visited several times during his grief). 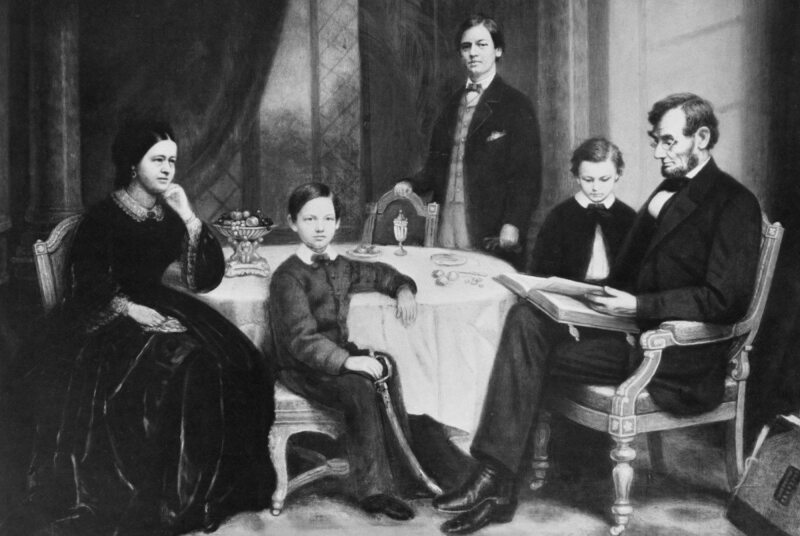 The Lincoln family in the White House, Willie seated beside his mother (image is in the Public Domain). 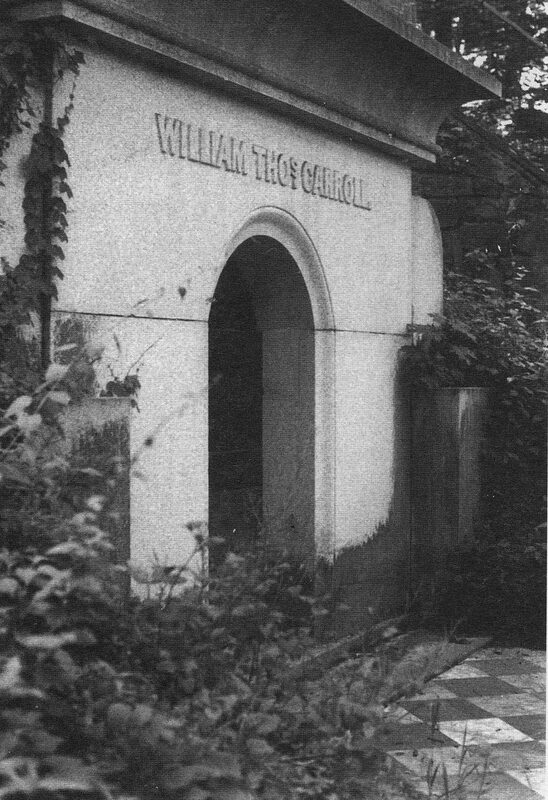 The Carroll Crypt in Washington DC, where Willie Lincoln's coffin was initially placed (image is in the Public Domain). 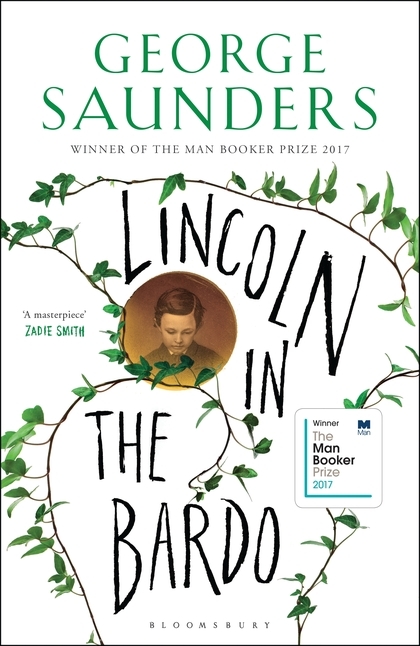 Like Ali Smith, George Saunders does not eschew the humorous potential of the situations that he writes about, but nor does he ignore the serious issues that underlie them: even in death, his Eighteenth and Nineteenth Century characters are divided along racial and class lines; and between loyalty to the British Crown, and the nascent Republic. 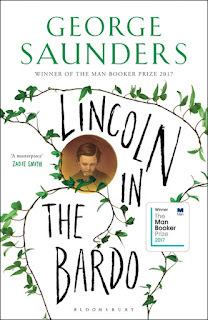 On another level, Lincoln in the Bardo is a sort of Dantean Purgatorio for our times, except that, where Dante (a late Medieval Catholic raised in the Scholastic tradition) had a high degree of certainty as to what the afterlife held in store, Saunders (our contemporary), and his characters, are shot-through with doubts, and have no Virgil or Beatrice to guide them. 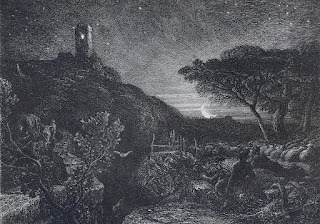 When characters do appear from the "familiar yet always bone-chilling firesound of the matterlightblooming phenomenon," it is very unclear whether they are leading our characters towards Heaven or Hell, and one understands why they choose, in many cases, to remain in the place and state that they know. "On our wedding day, I was forty-six, she was eighteen. 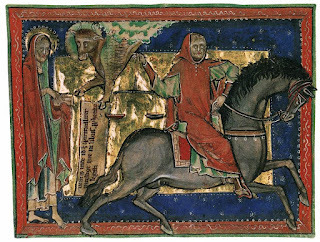 Now I know what you are thinking: older man (not thin, somewhat bald, lame in one leg, teeth of wood) exercises the marital prerogative, thereby mortifying the poor young - But that is false. That is exactly what I refused to do, you see ...I proposed that we should be ... friends ... I would expect nothing more of her ... she left a note on my desk ... she was happy, was indeed comfortable in our home, and desired, as she put it, to 'expand the frontiers of our happiness in that intimate way to which I am, as yet, a stranger' ... It was tacitly understood that, next night, we would further explore this 'new continent,' and I went to my printing offices in the morning fighting the gravitational pull that bid me stay home. And that day - alas - was the day of the beam ... a beam from the ceiling came down, hitting me ... as I sat at my desk ... Per the advice of my physician, I took to my ... sick-box ... Then the physician returned, and his assistants carried me to his sick-cart, and I saw that - I saw that our plan must be indefinitely delayed ... "
My third choice for 2017 is a work of non-fiction, Six Facets of Light, by Ann Wroe. 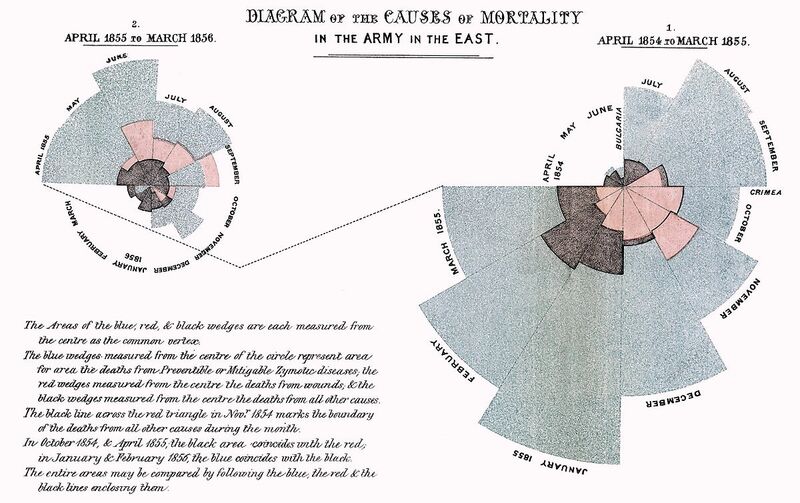 It does not focus on death, although death plays a role in the author's day-job (she is among many other things, a writer of obituaries), but rather on the English landscape, more specifically the downs and coastline of East Sussex. This is territory that is very familiar to me, since it is the landscape in which my mother grew up, and which was home to her ancestors as far back as we have been able to trace them. It is, technically, a 2016 publication, but appeared late in the year, and was given to me as a birthday present in January 2017. 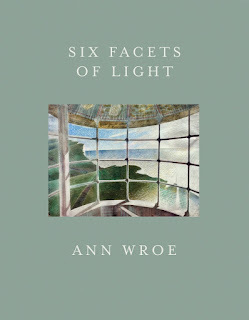 Ann Wroe herself describes the book as " ... a series of musings on light, compiled from wonderings, observations, and associations made while walking the luminous downs ... between Brighton and Eastbourne ... a love song to light, sung by myself and the various poets and painters of many eras, who have walked along with me." These poets and painters include, notably, Gerard Manley Hopkins, John Milton, R.S. 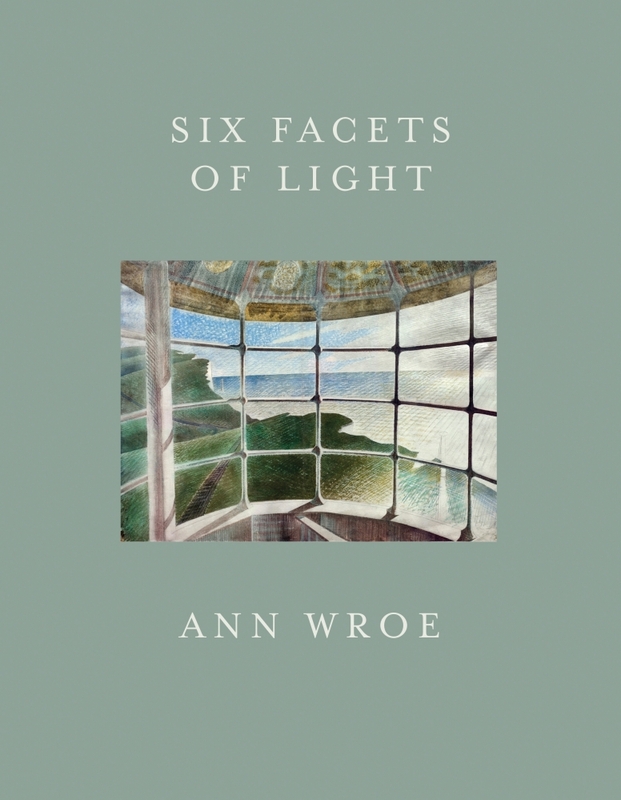 Thomas, John Clare, William Blake, Samuel Palmer, and Eric Ravilious, not all of whom knew this specific landscape as intimately as Ann Wroe and I know it, but all of whom, nonetheless, observed and documented the play of light on the landscapes through which they walked. The landscape is not unchanging, of course (few landscapes are, and probably none on our islands), and, as an archaeologist, I am trained to recognise the signs of change in the landscape: in the case of East Sussex, I cannot do so without an awareness that many of these changes were probably brought about by the labour of my own ancestors, as manifest in the flint walls of churches, in the lynchets of fields, and perhaps even in the forms of prehistoric round and long barrows, transformations that have continued through the centuries, despite political upheavals, plagues, and civil and foreign wars. "A Cornfield by Moonlight with the Evening Star," by Samuel Palmer, c 1830 (image is in the Public Domain). "The Lonely Tower," by Samuel Palmer, c 1879 (image is in the Public Domain). Lynchet at West Dean, East Sussex. Photo: Midnightblueowl (licensed under CCA). "Sixty miles south of London, reached by an ambling train that divides at Haywards Heath, lies Eastbourne in East Sussex. Weathermen say it is the sunniest town in Britain, with brightness almost every day ... The sea breaking on Holywell Lodge ... sparkles in sequinned foam, and a single yacht -there is always one - cleaves the sea like a blade. The artist Eric Ravilious was brought up here in the early 1900s, the tall, floppy-haired son of a man who, appropriately, made his living by selling and fitting blinds. On Sundays you might see him - 'the Boy,' as friends called him, in token of that unjaded child's gaze - arm-in-arm with his parents, walking briskly to the Methodist church where the minister preached hellfire. 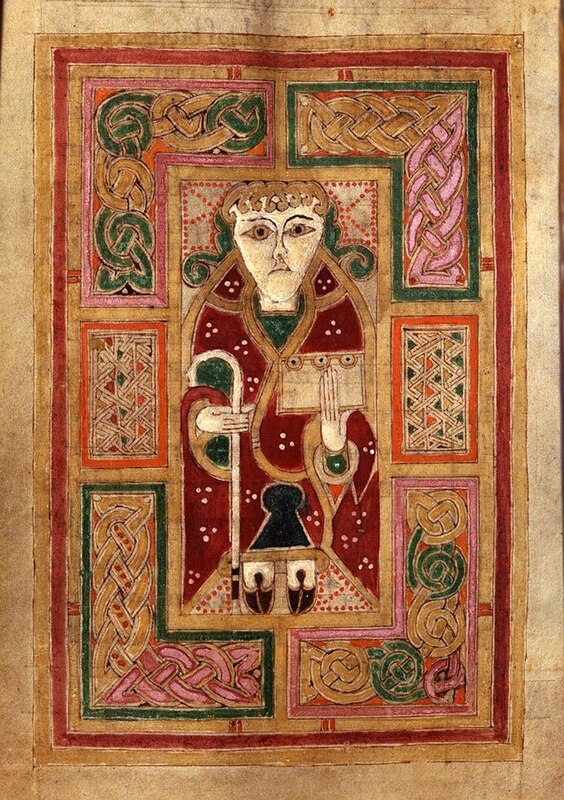 For hours he would sit there, morning and evening, in a hall darkened by infernal visions, watching through the high windows how the light played outside. He would hear above the wheezing organ seagulls crying light, scrapping for it, keening down the great curve of it, while wood-and-canvas biplanes buzzed them and more boats, sails shining, rode jauntily on the sea. 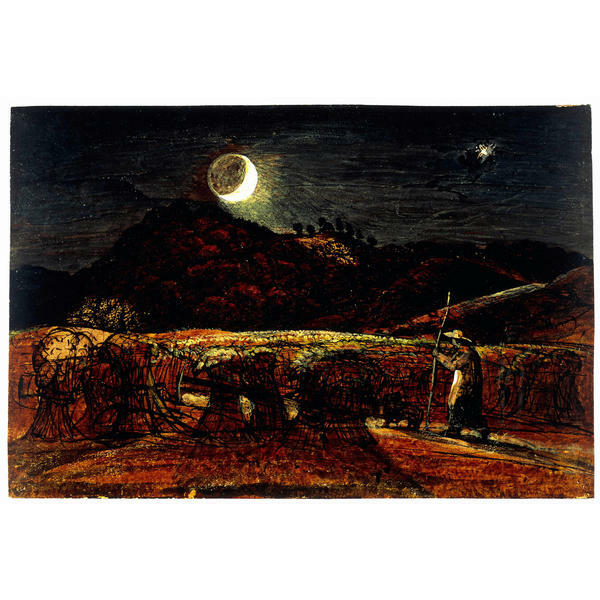 Or so he painted the scene later, adding - for good measure - vapour trails, clouds, fireworks." 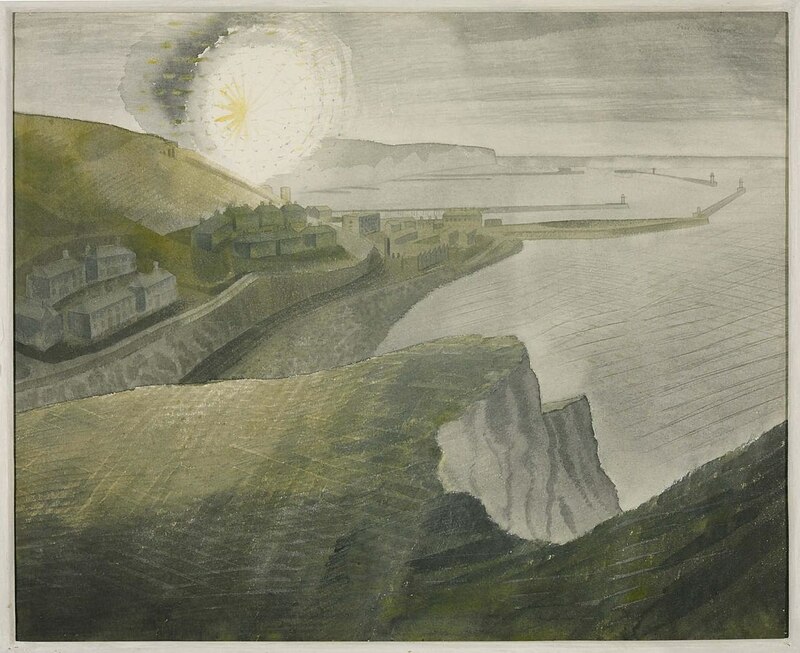 "Shelling by Night," by Eric Ravilious, 1940, Tate Britain (image is in the Public Domain).